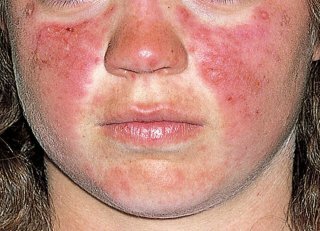 The skin is involved in more than 90% of people with the disease. Skin symptoms are more common in whites than in African Americans. The classic rash is a redness on the cheeks (malar blush) often brought on by sun exposure. This is an autoimmune disease related to arthritis which most often strikes women of childbearing age. It is a painful and potentially life-threatening illness. It occurs when the immune system attacks the body’s own tissues, causing inflammation. This can effect just about any part of the body, similar to arthritis, and sometimes there are no symptoms of lupus until the damage is already done. About 1 in 3 people with it develop inflammation of the tissue around the lungs. Heart Disease is a very big risk even in young women. People with kidney disease also need to follow special protein restriction guidelines to prevent further damage. Studies have found that some patients get symptom relief by taking Omega 3 Fish Oil daily for six months. Help prevent heart disease, and help fight the Chronic Inflammation that's present with the disease. "Omega 3 Fish oil apparently reduces inflammation by substituting for other fats when your body makes inflammation-generating biochemicals,"
Explains William Clark, M.D., professor of medicine at the University of Western Ontario in London, Ontario, and a leading researcher of fish oil. Nov. 7, 2007 (Boston) -- Fish oil supplements may help improve the symptoms, according to new research presented at the American College of Rheumatology's annual meeting. What's more, the supplements also improve blood flow and blood vessel function in people who are known to be at increased risk for heart disease.